Romacorp, Inc., parent company of Tony Roma’s®, is expanding its international retail presence with the company’s latest licensing deal with Aliminter, S.A., a leading Spanish manufacturer of sauces, dips, pickles and quality food products. 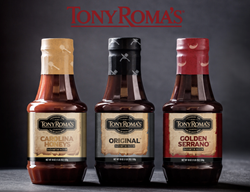 This agreement, facilitated by Broad Street Licensing Group, will bring Tony Roma’s world-famous BBQ sauces to retail stores in Spain, as Tony Roma’s continues to strengthen its brand presence through strategic global expansion in the retail space. This is the latest in a string of impressive licensing deals for Tony Roma’s, and follows the company’s most recent announcement of a landmark deal with Burts Chips, bringing Tony Roma’s BBQ sauce flavors to the potato chip category for the first time. Headquartered in Murcia, Spain, Aliminter, S.A. has more than 20 years of experience in the sauce, dip and pickle industry. The company offers a large variety of quality products and packaging for retail, food service, and food industry leaders throughout Spain, in addition to Europe’s most developed and mature markets. Aliminter, S.A. maintains its respect for the tradition of good food, but is also powerfully committed to the new challenges of the modern food market. The company aims to develop and deliver the unique tastes that consumers demand. This agreement is the latest development following an impressive year of brand transformations and announcements for Tony Roma’s, which recently celebrated its 45th birthday, a major milestone unmatched by any American casual dining restaurant chain. Recent Tony Roma’s announcements include new licensing deals in the United States, Europe, Mexico, Australia and New Zealand, renewed USA restaurant growth with new development and franchise agreements in Tennessee, Colorado, Idaho and West Palm Beach, Florida, accelerated international restaurant growth with new development agreements in Spain, Nicaragua and Bolivia, and the launch of Tony Roma’s new global prototype restaurant in Orlando, Florida. With restaurants in more than 30 countries on five continents around the world, Tony Roma’s is the world’s largest casual dining chain specializing in ribs. Romacorp, Inc., is the parent company of Tony Roma's restaurants, the world's largest casual dining concept specializing in ribs. Headquartered in Orlando, Florida, Romacorp, Inc. has nearly 150 restaurant locations in more than 30 countries and is one of the most globally recognizable names in the industry. The first Tony Roma's restaurant opened 45 years ago in North Miami, Florida. Tony Roma's is also proud to partner with the Make-A-Wish Foundation (http://www.cnfl.wish.org), one of the world's leading children's charities, in an effort to help grant the wishes of children with life-threatening illnesses across Central and Northern Florida. For more information about Romacorp, Inc. and Tony Roma's, visit http://www.tonyromas.com. Please visit http://www.tonyromasfranchise.com or call (866) 981-0586 for information about Tony Roma's franchising opportunities.